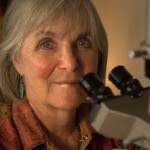 Wine’s Molecular Expressions photomicrographs: form and function | Sondra Barrett, Ph.D.
For decades I have captured the incredible beauty, spirit, and hidden expressions of wine through a special light microscope. Such unique portraits of wine help preserve the memory of special moments in a wine’s life and yours. The photographs can be for used for fine art in the living room or tasting room, wine labels, or visual wine tasting events. Beyond the beauty, there is value to the winemaker in being able to visually follow a wine as it ages, discover if it reveals the signature of ageability or whether it is losing its vitality and beginning to fall apart. You can now not only taste the wine you can see its layers of expression. In wine’s creation story, it is evident that yeast adds something essential to the mix of sweet juice, acids, tannins, and pigments. This image illustrates early fermentation of chardonnay. 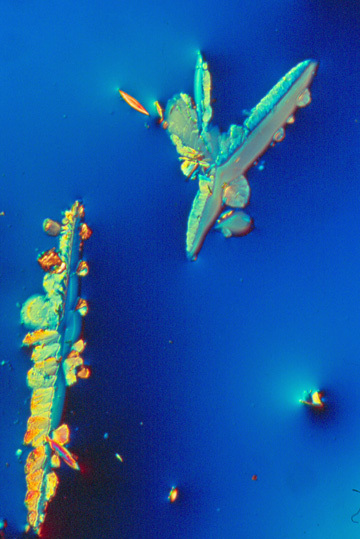 The tiny circles are Montrachet yeast. 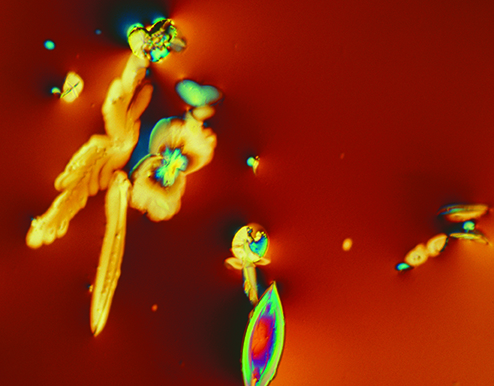 Yeasts transform sugar into bubbly carbon dioxide and alcohol; the alcohol brings more light to the microscopic display as it changes the refractive index of the fermenting juice. I interpret the light as reflecting spirit and vitality, though technically it’s a lot more. Through grape’s partnership with yeast, the alchemical transformation of fermentation begins. Yeast loves sugar in the sweet grape juice, chews it up and converts it into bubbly carbon dioxide and spirited alcohol. When grapes ripen from tight young green berries to plump juicy fruit at harvest time, sugar content increases. Typically grapes are harvested when the sugar reaches about 22-24%; percent sugar is also called Brix. The general rule, for every 2 Brix (2% sugar), 1% alcohol is produced. A wine label that says the alcohol is 12.0% also tells us at harvest the grapes were around 24 Brix. If the ferment reaches 15% alcohol yeasts’ work often ceases. It is said that the great maestro of wine André Tchelistcheff could recall any wine he tasted, that he remembered the expressions of wine as personalities and shapes. In Michael Chiarello’s Napa Stories, Andre is said to have changed how he tasted wine after he stopped smoking. For decades his experiences came in the shape of a pyramid. When he stopped smoking, his tasting expanded to the shape of a fan. In the 1980s Grape Grower Rachel Balyeat hosted a special dinner to show my wine photographs to André to ask him – what are they? 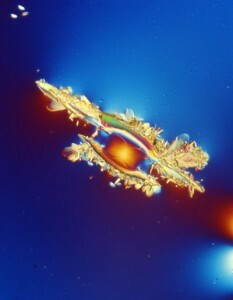 André said, “the photos showed the jewels in wine. 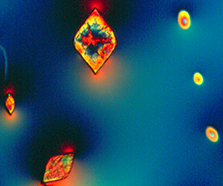 These photographs of wine through a polarizing microscope, reveal unexpected patterns, shapes and incredible beauty. Some ‘jewels’ are said to portend long life, style, and character. Others may reflect the signature of the winemaker or the spirit of the wine. Wine’s inside stories have appeared in numerous publications and venues including The World of Fine Wine Magazine, Scientific American, American Wine Expo, Sterling Vineyard, Alpha Omega Winery, Vineyard Vista, Earthrise Retreat Center, Lawrence Hall of Science, Copia, Grgich Hills, Hope & Grace Tasting Salon and Jessup Cellars in Yountville, CA. One of the reasons I became so fascinated by inner world of wine, it showed the story of life, transformation and our senses. 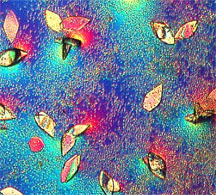 Juice, through the microscope is tiny. From fermentation on the forms transform, become more complex, change, and grow larger. I’ve even seen clues that a wine is losing its vitality and clues that a wine will age well and live long. What secrets a drop of wine can reveal when you know how to see. These two images illuminate how a wine opens up as it ages. Both are 2002 Rudd Oakville Estate Cabernet Sauvignon. The photograph on the left is the younger wine by 6 months. It was silky and smooth, yet was more closed, focused, and tight while the wine on the right aged for another 6 months has softened, opened up and shows more complexity. Interestingly, the slightly older wine now reveals signs of great aging potential. Both times when these wines were tasted they were smooth, rich, and elegant. 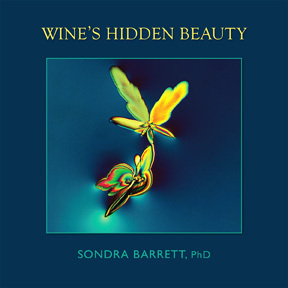 THE BOOK: WINE’S HIDDEN BEAUTY – Includes hundreds of wine portraits and the more mystical story of wine. You can still purchase a copy while we have a few left. Reproductions and gift items of my photomicrographic art can be purchased at Fine Art America. Custom photography of your favorite libations, supplements, drugs, etc is another option.